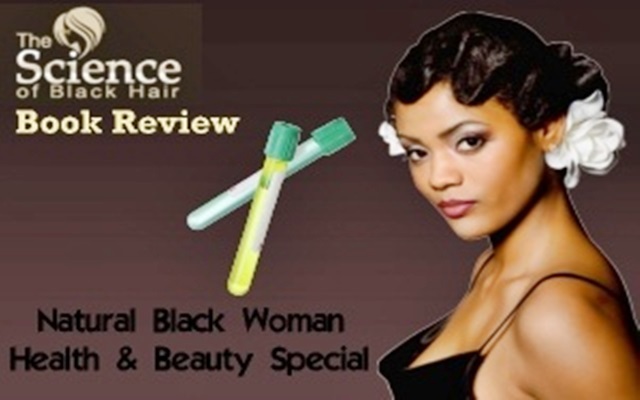 The Science of Black Hair lives up to the promise of its title in every way – because it is an in-depth, scientific guide to caring for afro textured hair. At 8×10, 240 pages long and written in double columns, this is a hefty piece of work that clearly took years to research and write. As the first scientific book ever written on afro textured hair, it puts black hair on the map, giving it an importance and status that was missing from the public domain. Now that The Science of Black Hair has finally arrived one wonders why has it taken so long? I guess the answer to that question is that it needed someone with the knowledge, scientific background, zeal and perseverance to undertake such a challenge and African American Audrey Davis-Sivasothy was the right person for the task. Although a science-based book, the author has taken great care to present the information in a clear, concise and accessible way that the average person can readily understand. It is divided into five sections, with the first exploring the scientific structure of the hair and scalp. This section of the book offers an in-depth examination of the composition of the hair and the scalp with the result that black women are informed about how their hair and scalp reacts to certain conditions. In so doing they are empowered to take responsibility for the management of their hair through conscious choices, rather than leaving it to chance. The author wastes no time in dispelling the damaging myths about afro textured hair that most black women, myself included – were raised on and which have misguided us for years. The most common one being that we must avoid water at all costs because getting our hair wet dries it out! The second and largest section of the book is devoted to healthy hair management and this is the most valuable, because it documents all the hair problems that restrict growth and looks beyond the treatment of the hair to nutrition and the environment we live in. It also explains how adopting a hair care regimen is the foundation for preventing and minimising hair damage, developing healthy hair and ultimately retaining hair growth. The author goes into detail about how different types of shampoos and conditioners react with afro textured hair and the hair types each are most suited to. The third section deals with managing chemically treated hair that is relaxed, permed or coloured. It should be noted here that what makes this book a truly comprehensive guide is the fact that it does not divide natural afro textured hair from hair that has been chemically treated – both are catered for. What the author does do is point out the damage that chemical treatments do to the hair, how the damage can be minimised and what steps to take to correct the problems that will arise. The author also offers advice for women who have chemically treated hair who want to go natural, explaining what the most effective transitioning methods are. The fourth section deal with children’s’ hair and the fifth, diet and nutrition. The last section is important as it not only explains what foods help promote healthy hair growth, but also offers a useful guide to protecting, caring and styling hair for women who regularly work out. Other great aspects of this book are the dozens of photographs including detailed magnified images of the hair and scalp; and interviews with natural hair care and product providers – plus a comprehensive list of recommended products. Although I read the book eagerly from cover to cover in 24 hours, it should be said that this is really a reference book – or more accurately an encyclopaedia of afro textured hair. But instead of placing it on a bookshelf, keep it in the bathroom where it can be easily accessed when washing, conditioning, detangling and styling the hair. I highly recommend this book to any black woman who wants to become a scholar of afro textured hair and master the science that will help grow long and healthy tresses!